What conditions does Claritin-D 12 Hour treat? Tell your doctor right away if any of these unlikely but serious side effects occur: seizures, mental/mood changes (such as confusion), difficulty urinating. List Claritin-D 12 Hour side effects by likelihood and severity. This medication should not be used if you have certain medical conditions. Before using this medicine, consult your doctor or pharmacist if you have: glaucoma (narrow angle type), severe difficulty urinating (urinary retention), severe high blood pressure, severe heart/blood vessel disease (coronary artery disease), liver disease, experienced serious side effects with decongestants (irregular heart rhythm). What should I know regarding pregnancy, nursing and administering Claritin-D 12 Hour to children or the elderly? Before using this medication, tell your doctor or pharmacist of all prescription and nonprescription products you may use, especially of: adrenalin-like drugs (e.g., ephedrine, methylphenidate), certain high blood pressure drugs (e.g., guanethidine, methyldopa, reserpine, beta-blockers such as propranolol), herbal products containing ephedra. 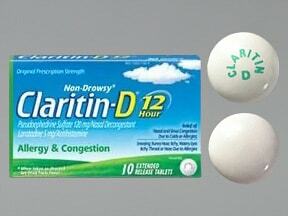 Does Claritin-D 12 Hour interact with other medications? 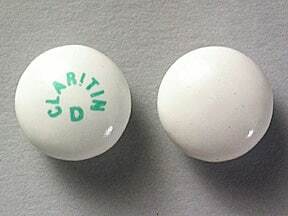 This medicine is a white, round, coated, tablet imprinted with "CLARITIN D". 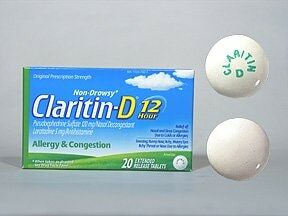 Have you ever purchased Claritin-D 12 Hour?